Spring practice is the time for college football coaches to take stock of their programs and sweat the details, whether or not they actually have anything to worry about. 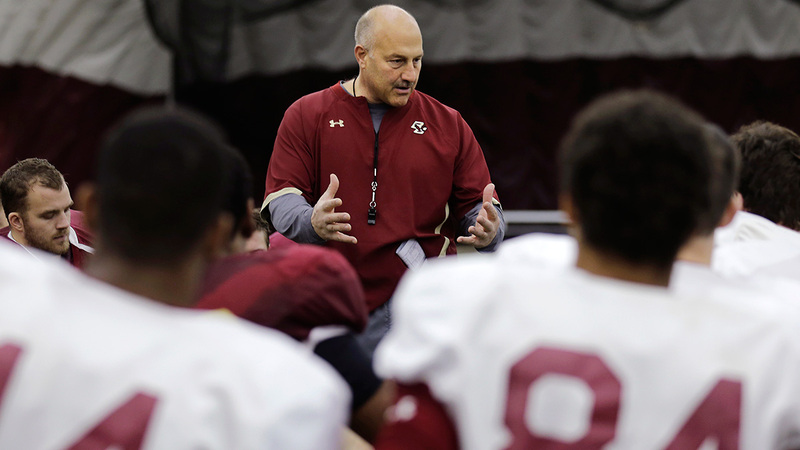 This year, Boston College coach Steve Addazio spent his spring worrying about bodies. More specifically, he was concerned about the big bodies required to forge a modern offensive line, and his team’s sudden lack of them. Ideally, Addazio hopes to carry a minimum of 16 offensive linemen on scholarship, enough to field a full two-deep while leaving a handful of redshirts, scout-teamers, and injured bystanders to spare. When BC opened spring drills in February, though, Addazio counted just nine — more like seven and a half, really, with senior Harris Williams sitting out contact drills because of a lingering ankle injury and sophomore Jon Baker relegated to part-time duty by a bum knee. The few healthy bodies up front included fresh converts from both the defensive line and tight end position, plus a true freshman who weighed just 236 pounds when he enrolled early for the spring semester. Large-scale turnover on the offensive line doesn’t have to be a death knell for ambition, as Ohio State proved last season when it rode a reconstructed front all the way to the national championship. Yet assembling a new O-line from scratch requires more than merely replacing the individual parts: More than any other segment of a team, the offensive line functions fundamentally as a unit, a battalion of five gigantic bodies synchronizing into a cohesive bloc within a confined area that offers precious little margin for error. With a few exceptions — a false start, a hold, a tackle getting beaten badly around the edge — when one lineman fails, it’s a failure of the entire line, and subsequently the entire offense. When success hinges on the entire group executing its assignments in concert, individual recognition doesn’t count for much, and it is reserved mainly for singling out incompetence. NCAA guidelines allow for a maximum of 20 full-contact practices — eight in the spring, 12 in the preseason — between the last game of one season and the first game of the next. Officially, that’s all the game-like time coaches have to teach, correct, and evaluate players who have played sparingly, or not at all, in actual games. When those players stand to make up three-fifths, four-fifths, or all of the starting offensive line, the decisions reached in those fleeting spring and summer windows have the potential to make or break the eventual campaign. Here’s a step-by-step guide to how those rebuilding decisions are made. When traditional recruiting leaves a void, shortcuts are available. As ever, the stopgap of first resort is the NCAA’s answer to the D-League: the junior college circuit, where late-blooming and/or wayward talent often flies under the radar. This fall, for example, Florida State plans on plugging in a pair of juco products, juniors Kareem Are and Chad Mavety, who redshirted last season to preserve two years in the Noles’ starting lineup. Recently, hard-up coaches have also enjoyed the option of pursuing a graduate transfer who has already earned his degree from another school,3 a rule Addazio has exploited to fill a recurring vacancy at left tackle: While he doesn’t have the luxury of recruiting juco players because BC admissions standards effectively forbid it, Addazio was able to achieve a similar effect the past two years by bringing in a pair of fifth-year transfers from Florida, Matt Patchan and Ian Silberman, both of whom Addazio recruited to Gainesville in his days as a Gators assistant under Urban Meyer. Patchan and Silberman combined to start 25 consecutive games at BC, with Patchan picking up a second-team All-ACC nod in 2013 and Silberman going to the 49ers earlier this month as a sixth-round draft pick. If worse comes to worst, desperate coaches can poach a body from the defense, which is how Penn State wound up with a freshly converted defensive tackle, Brian Gaia, as its starting right guard last year after a preseason injury to the incumbent, Miles Dieffenbach.4 But a conversion that dramatic is almost always a last resort. Occasionally, though, the burden of filling a starting role will fall to an 18- or 19-year-old fresh from high school, at which point mitigating the potential disaster becomes a matter of both quality and quantity. It helps, of course, to be one of the handful of heavy-hitting programs that routinely has access to a can’t-miss prep talent like, say, Martez Ivey, the crown jewel of Florida’s most recent recruiting class and the Gators’ likely starting left tackle from the day he arrives this summer until the day he leaves for the next level in (presumably) three years. But the Gators’ 2015 crop also included signatures from four other, far less touted linemen, any one of whom could wind up playing a prominent role this fall on a front with no incumbents to dislodge. 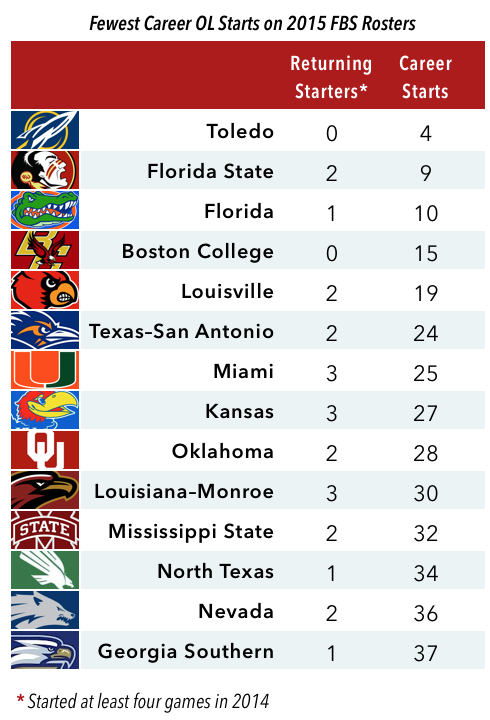 For Boston College, which operates much too far down the recruiting food chain to seriously pursue blue-chip prospects like Ivey, the incoming class doesn’t offer an individual headliner or heir apparent with an obvious path to the NFL. But it does feature six candidates for immediate playing time, three of whom (Anthony Palazzolo, Aaron Monteiro, and Wyatt Knopfke) rank among the top four overall prospects in BC’s class, according to 247Sports’s composite ratings. Far more important, at least as far as Addazio is concerned, is the fact that the freshman linemen are his kind of linemen, which he insists is worth more to him than the grades handed down by a smattering of websites. After failing to land a single offensive lineman in his first BC recruiting class6 and signing just three O-linemen in 2014, the trench-heavy 2015 class feels like a major step in remaking the depth chart in his own image. That may seem like it goes without saying, but what exactly qualifies as “production” at a position that defies virtually all attempts at statistical insight, and where success hinges on behemoths executing split-second feats of footwork and hand placement amid a flailing maelstrom of bodies? To the trained eye, there’s a certain degree of nuance in the chaos. Addazio grades his linemen according to four Bs — BASE, BEND, BALANCE, and BURST, a rubric he recites with such authority that it demands to be rendered in all caps — and tacks on extra credit based on how aggressively they finish blocks downfield. Beyond the basic physical requirements, Penn State’s Hand emphasizes the ability to process the defensive alignment, communicate changes, and adjust accordingly in the minuscule window of time before each snap. Even for veteran coaches who have spent decades poring over the intricacies of line play, though, only so much can be gleaned in the heat of an afternoon session. When most of the depth chart is a blank slate, drawing firm conclusions about which players deserve to fill in which blanks requires homework. Each position on the line comes with its own checklist of criteria that an aspiring starter should meet. In most offenses, the starting tackles will be taller and more athletic than the interior linemen, the better to nullify increasingly explosive pass-rushers off the edge. As offenses have evolved to become more pass-friendly, left tackles in particular have become increasingly prized not only for their bulk, but also for their wingspan; this is why a seemingly arcane attribute like arm length, a largely foreign metric 15 years ago, has come to play such a central role in evaluating potential draft picks. Guards generally aren’t able to cover as much ground while pass-blocking, but they compensate by serving as powerful drive blockers in the run game. Centers tend to be the runts of the litter — relatively speaking; most FBS centers these days are still only a couple of buffet trips shy of 300 pounds — but also function as the unit’s central brain, tasked with bellowing out assignments and adjustments to the rest of the line based on the defense’s alignment. If there’s an Academic All-American in the group, or perhaps a rocket scientist, he’s probably playing center. In fact, it’s relatively rare for a college lineman to spend his entire career in the same spot, and guys who are able to hold their own at multiple positions along the line become invaluable when there’s an injury, which often creates a ripple effect across multiple positions as coaches attempt to reconfigure the starting lineup around both the injured player and his replacement, who isn’t necessarily suited to slide into the same spot. Take Florida State, which watched its backup center, redshirt freshman Ryan Hoefeld, struggle mightily last year after moving into the starting five in place of injured starter Austin Barron in early October. After a series of close calls, FSU benched Hoefeld in November and shifted over All-American left tackle Cameron Erving, who proved to be such a natural in the middle of the line that he was widely projected to remain at center in the NFL and subsequently drafted in the first round by the Browns. 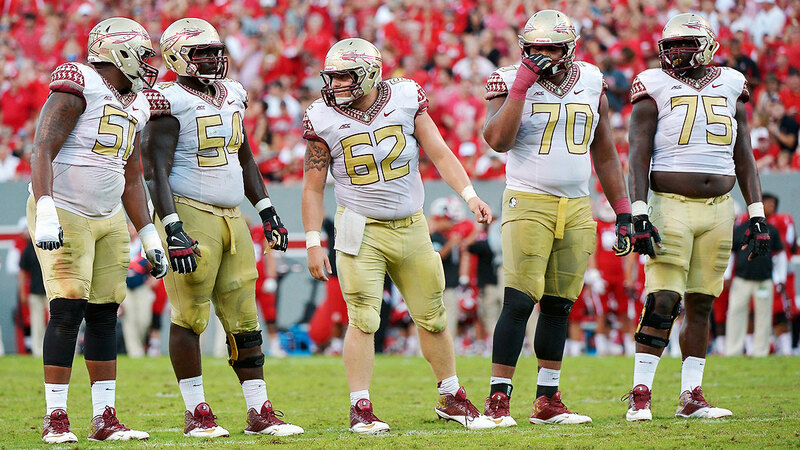 Meanwhile, Erving’s successor at left tackle, 2014 true freshman Roderick Johnson, is now Florida State’s only returning starter up front and appears to be entrenched on the left side. Most teams have to resort to that kind of mixing and matching to get through a full season: Another playoff team, Oregon, shuffled nine O-line starters through seven different configurations in 2014, and that was after losing starting left tackle Tyler Johnstone in the preseason. However, very few schools have the luxury of plugging an All-American into one problem spot and a future All-American into another, like FSU did last year. For outfits that lack playoff-caliber depth, losing the wrong domino at the wrong time can topple the entire unit. 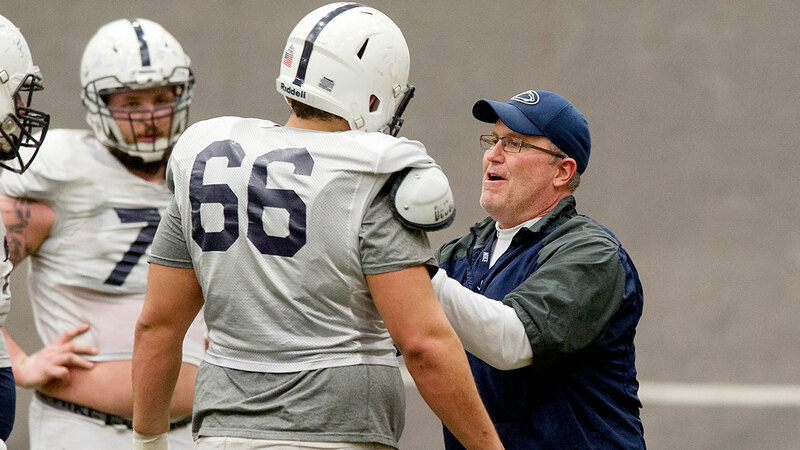 At Penn State, Hand says, linemen are categorized into three broad categories: true tackles (who stand 6-6 or taller), swing guys (in the 6-4 to 6-6 range, with enough girth to play guard and enough length to play tackle if necessary), and combo players (guards and centers). Freshmen are generally restricted to a “home base” position, to prevent mental overload, and a priority is placed on cross-training as many linemen as possible to play center, which is slightly more specialized — the center has to be able to execute a clean snap while also contending with the same heavy lifting as everyone else — and more difficult for a transplant to pick up on short notice. (“It’s different when you have the ball in your hand,” Hand says. “You could very quickly be on your fourth center over the course of a season because it’s a long year.”) Still, there’s no telling how the puzzle might have to be rearranged if certain pieces are suddenly removed. At various points in 2014, the Nittany Lions’ starting center, Angelo Mangiro, also wound up being conscripted into part-time duty at left guard, right guard, and right tackle. At Boston College, winter conditioning includes a borderline-sadistic drill in which one player contorts himself into a chairlike position, back against a wall, and balances weights on his knees. At the same time, another player pushes a 45-pound plate around the room as fast as he can. The longer it takes the second player to finish the course, the longer his teammate has to support the weights on his knees; if the player against the wall drops the plates, his teammate has to go back to the starting line. Addazio’s description of this regimen alone will turn the listener’s thighs to jelly. When people talk about “team chemistry,” they’re usually invoking the term in the abstract, with the understanding that the bonds that unite a group of individuals as a single unit are inherently elusive. Chemistry might exist, in some ineffable way, but only between the right individuals, and usually only with time. A team has it or it doesn’t; it’s not something that can really be taught. In the long run, the best thing about hitting reset on an entire position group is the anticipation of watching the mewling hatchlings grow into their potential as veterans. Sometimes, as we saw with Ohio State last year, the arc of the line’s maturation seems almost impossibly steep. More often, the promise of a distant payoff is the only thing that makes the initial growing pains worth enduring. Take Penn State, where Hand concedes that 2014 was a miserable year for the offensive line: The Nittany Lions finished last in the Big Ten in rushing offense and sacks allowed, frequently leaving blue-chip quarterback Christian Hackenberg to fend for his life as PSU limped to six low-scoring losses in its last seven conference games. But the four new starters who were shoved into the deep end last year will be four returning starters in 2015, all now in their third or fourth year in the program. Three of those four (left tackle Andrew Nelson and guards Gaia and Brendan Mahon) are scheduled to be around through 2016, by which point they will have been playing alongside each other for so long that their eventual departure from the lineup may well be met with the same hand-wringing that greeted their arrival. The deepest fear of any coach is that the sport’s natural life cycle — rebuild, flourish, rebuild, flourish, etc. — will be disrupted by a class, or series of classes, that never manages to mature into a cohesive whole, never flourishes, and only serves to prolong the rebuilding phase indefinitely. A stagnant cycle can quickly begin to look more like a spiral, and it can take the coaching staff down with it. At the beginning, though, the concept of rebuilding is inherently optimistic: The job may take time, but in a year or two, when it’s actually built, the finished product will prove to be worth the investment. “I don’t care how talented you are, there’s a learning curve there,” Addazio says. “You can recognize the potential [early on]. I think you can recognize that, hey, we got the right guys here. But how long it actually takes them to jell and for each guy to develop at a level enough to be successful, it’s just hard. It’s very difficult to guess and judge what a freshman’s going to be like [in the future] as a freshman on the offensive line. The position requires way, way too much. … O-linemen are made. You’re born with some innate skills, but an O-lineman is made. It’s a developmental position. Williams is no stranger to the starting lineup, having started every game in 2013 at right guard, but he missed essentially all of 2014 after fracturing his ankle in the season opener. The only other lineman with starting experience is Baker, who started one game last year as a true freshman. Another projected starter for the Gators, Roderick Johnson, retired in April after being diagnosed with a spinal condition. Unlike undergrad transfers, graduates don’t have to sit out a season at their new school as long as they pursue a degree their original school does not offer, a loophole the NCAA opened in 2006 but may close again soon if certain athletic directors and conference commissioners get their way. How Gaia wound up blocking his own teammate in one of many blooper-reel moments for the Nittany Lions offense remains a mystery. Palmer actually rated as the nation’s no. 2 juco tackle, according to 247’s composite ranking, but we can forgive Hand’s enthusiasm. To be fair, that failure more accurately belongs at the feet of Addazio’s predecessor, Frank Spaziani, from whom Addazio largely inherited the 2013 class when he arrived at BC in December 2012. Two of those four, Jamon Brown and John Miller, graduated to a big NFL payday as third-round draft picks.